your body, lifestyle, and needs. As you change and grow, so can your yoga practice. Questions about private yoga instruction? Email Vanessa at dragnevan@gmail.com. 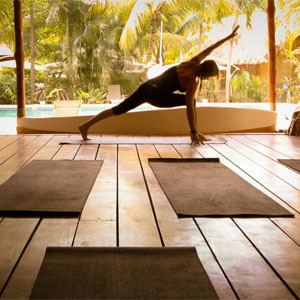 Daily Yoga classes are scheduled from 10:30-12:00, upstairs in the Rancho. They are semi private, for a max of 8 practitioners. Our teachers build each class based on the level and the needs of the students each day. The cost is $20 per class and is paid in cash at the time of the class. Click the pdf below for the teaching schedule. Always striving to offer a better service to our guests, Living Hotel proudly announces its new partnership with Spacio, a unique jungle spa with their array of specialized therapeutic and aesthetics services. A lovely 5 minute walk from the Living Hotel’s reception, Spacio is very quiet and private. Their offerings include a variety of services ranging from relaxing to therapeutic with Swedish, deep tissue, facial, abdominal and foot reflexology options available. Spacio also provides a wonderful spectrum of body care and natural treatment aesthetic services to include: organic facials, waxing and mani/pedis. Their skilled professionals can accommodate multiple and simultaneous sessions, for surfers, couples and kids alike. So bring a friend, and contact us at livinghotelreception@gmail.com to book your appointment. This Swedish/stretching blend of the Jungle Massage is tailored to each guest’s individual needs and desires, never very soft but perfect for relaxing. The firm and continued pressure in slow motion generates deep rest to fascia, muscles, ligaments and tendons. A highly relaxing experience which will relieve fatigue while you receive the benefits that foot reflexology provides. Improve the flow of energy and fluids of the circulatory, lymphatic and nervous systems. Relaxes all facial muscles, releases accumulated tension in the neck, shoulder and pectoral plexus. This therapy dispels the tensions reflected in the expression of the face, giving peace and a deep and lasting relaxation. You have to try this once in your lifetime. It’s incredible. Your thoughts will stop and you will give yourself over to the physical sensations. One and One 60 min. $170 / 90 min. $245. Share the journey with your partner at your side. Wonderful treat for your children, brings peace and grounding energy. New generations need stress release too. One of the most special moments to receive a massage.. Your body and your baby will experience great calm and happiness. It makes you live the moment, second by second. Your body will absorb the heat from the stones and the stones are going to absorb your fatigue, taking you to state of indescribable peace. Nurture, protect and clean your skin with our organic, fresh made and non-allergic products that are applied with a massage that stimulates the lymphatic and circulatory systems. Special clay with extracts of chamomile, aloe and mint will give a gentle exfoliation and deep cleaning of the pores. Heal and rejuvenate the skin through our hydrating and cleansing masque, and a delightful massage to the face and neck. Combine three or more and get 10%off. +Bikini $35usd. +Brazilian $60usd. +Half leg $40usd.+Full leg $80usd. +Stomach $40usd. +Chest $40usd. +Back $50usd. +Eyebrows $15usd. + Upper lip $10usd. Reg. Nail polish $10 / Shellac $15 . Relieve many common discomforts like excess water, sinus pressure and migraines. This relaxing technique is perfect if you spend time in the water or before flying home. Get 30 minutes of deep tissue massage of your back and neck + two ear candles then grab your board again!. Get 60 minutes of deep tissue full body massage + Pedi spa with Shellac and rock your next class. Get our 90 min. Full body treatment Ocean Breeze + our Organic Facial. Your skin will be refreshed and your face will look radiant..
Get foot massage and Champy together. It’s not about time, nirvana is here and now. ALL PRICES ARE SHOWED IN US DOLLARS. GIFT CERTIFICATES AVAILABLE.